All nighttime military, law enforcement, and emergency medical operations require some form of effective visual enhancement. Night vision goggles (NVG) and night vision imaging systems (NVIS) heads-up displays are viewing devices that amplify red and near infrared light, (i.e., night sky radiation and other red/near IR sources) projecting it on a small green phosphor display. The current generation of goggles (GEN III) has met the challenge of enhancing visibility to the level necessary for night time avionic operations through increased sensitivity in the red and near IR spectrums from approximately 610nm to 930nm. Unfortunately, instrument sensitivity presents a compatibility problem with ancillary display systems. Surrounding displays illuminated with unfiltered incandescent lamps or LEDs (light emitting diodes) can interfere with NVG since they can emit significant energy in the infrared (IR) region of the spectrum. Excess IR radiation can cause conflicts with NVG night vision functionality. For example, IR interference can cause night vision goggles to bloom (creating a halo-like glow around the displays and reducing visibility), create ghosting images (IR reflections from the cockpit surface), or goggle sensitivity loss due to activation of the automatic gain control due to higher levels of of IR. The illumination of some military cockpit displays generates enough energy in the GEN III goggles’ response spectrum to affect the goggles automatic gain control. The gain will lower in response due to the display noise thereby lowering the sensitivity of the goggles to the outside environment. This is analogous to the human eye constricting when exposed to higher levels of light in its response spectrum making it less responsive to lower photopic light sources. The solution is to filter the display (light source) so that it emits the necessary light for proper operation in both day and night environments while attenuating levels of the respective red and near IR radiation (i.e., removing the component that falls within the NVIS response curve). The filter must attenuate the noise to a level less than the lowest outside night sky radiation reflective source. 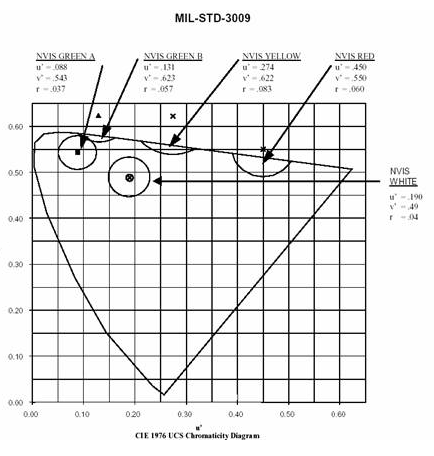 MIL-L-85762A establishes the requirements for NVIS compatible aircraft interior lighting. There are two types of night vision goggles per MIL-L-85762A: Type I and Type II. The response spectrum and sensitivity for the Type I and Type II goggles are comparable. The Type I NVIS system uses Generation III image intensifier tubes to display the image on a phosphor screen in the users direct line of sight, whereas the Type II NVIS projects the image on a transparent medium in the users line of sight (similar to standard heads-up display technology). The Type II configuration allows for simultaneous viewing of the intensified image and the cockpit displays. The Type I goggle user must look below the goggles’ display in order to use the control instruments. Both goggles are equipped with a minus blue filter for heavy suppression of the visual spectrum before the radiation can reach the image intensifier tubes. There are two minus blue filters available (Class A and Class B) – long pass filters with a Tp at 625nm and 665nm, respectively. The Class B filter lets less of the visual red spectrum pass; therefore, Class B NVIS is compatible with red cockpit lighting and the Class A systems have a spectrum overlap and cannot be used with the NVIS red lighting. For a cost effective filter, it is critical to undertake the design in terms of the specific application so that the requirement is met, not necessarily exceeded. Incandescent subminiature lamps typically used in integrally illuminated instruments and panels have a broad emission throughout the visible spectrum. However, the majority of the radiated energy lies in the infrared region. Filament temperatures vary over a very broad wavelength range extending from 400 nm in the visible (blue) region to 10,000 nm in the far infrared. Typical temperatures for low wattage subminiature lamps range from 1850 °K – 2275 °K. Lumitron monolithic NVIS glass is designed specifically for incandescent lamps. Our Monolithic glass construction NVIS ring filters and NVIS lamps (lamp/filter assemblies) offer reliable, rugged, and temperature resistant NVIS compliance in lighting applications where low wattage subminiature incandescent lamps are the preferred source of illumination. NVIS compatibility is achieved when the glass is machined with a wall thickness of 0.040” (1.0 mm). Lumitron monolithic glass NVIS filters and lamps are available in either a matte or polished finish. LEDs as a light source in a display heavily influence its color, contrast, and NVIS radiance (NR) properties. Lumitron offers 6-series plastic NVIS filters that are designed to optimize the unique spectral emission properties of LEDs, allowing for higher visible transmission than our 3-series glass NVIS filters. Lumitron also offers LEDs in single colors such as blue, green, yellow, red, and white. Relatively new semiconductor chemistry based on gallium nitride has enabled high-effeciency blue LEDs to emerge into the market place. This new GaN now yields very high brightness blue emission. In turn, the blue emission can be harnessed to generate a “white” LED color. The white emission is realized by applying a thin phosphor coating over the blue emitting LED. White LEDs with broadband spectral emission can be filtered with Lumitron 6-series plastic NVIS filters to produce displays that comply with various NVIS color coordinates described in MIL-STD-3009. A narrowband LED source that inherently complies with the correct color coordinates. Please note that the monochrome narrowband emission LEDs with non-compliant color coordinates generally cannot be rendered compliant with the addition of an NVIS filter.